* All Money is Created as ECUs (Electronic Currency Units) by Local Banks. * No Money is issued to anyone other than reliably employed workers . * No Money could be transferred to ANY other person or business. * Only 1 Local Bank could start a Network of customer-owned Local Banks. * A Network of Local Banks could expand to a Universal Money Standard. * ECUs could be called SHAROs instead of Dollars for example. * All workers (worldwide) would be given an Employee status. * All Employees would be paid appropriate Wages regularly & automatically. * All traditional money would eventually become obsolete and discarded. * No taxes of any kind would ever be required by anyone in ShareFlow. * All Products and Services would sell using 100% Non-Profit operations. * Appropriate Universal Single-Payer Healthcare would be guaranteed to all. * All Public Education would be free for everyone at any age level. * ECUs in circulation would be used only once and then archived. * All Products and Services would be value priced fairly and equitably. * Only Employment types for the Common Good would be supported. * Everyone could choose a type of work best suited for their need. * 100% Renewable Clean Energy would be used in all operations. * No one would or could ever go into debt since debt cannot exist. * Political money, poverty and homelessness would all disappear. * SHARO ECUs could become a global & universal monetary standard. * All beneficial enterprises would be given adequate monetary support. * All ShareFlow operations would be 100% transparent to the public. The SANE Economic Model is neither a capitalistic nor a traditional socialistic doctrine, but rather a compassionate composite of the best of both worlds along with some important additional features. To operate properly, all subsystems provided for SANE need to be networked together in conjunction with a new form of government explained in an alternate page on this website: The Socially Adjusted Network Government (SANG). With all SANE subsystems working together, the end result would be the elimination of all the antiquated money concepts that have complicated our lives for so long. SANE would totally eliminate the use of credit cards, loans, debt, interest, visible taxation, future speculations, stocks, bonds, investments, trusts, checking accounts, drafts, paper currency, coins, food stamps, the Gold Standard, and the whole bit. All monetary transactions could then be recorded electronically, no matter how trivial. And since personal Account Monitors (AMs) could be designed to look like thin cellphones (Ipods), etc., everyone could carry one along with an appropriate ShareFlow Debit (SFD) card conveniently and have easy access for any transaction. ShareFlow would be designed to eliminate the possibility of acquiring any funds that are not legitimate, because all transactions would be secured, since it is theoretically possible for any financial system to be rendered foolproof against hacking. Thus, all transactions could be logically and redundantly validated and secured without undue worry that the system would be compromised or crashed in any significant manner. As a result, any transaction (wage allocation, product or service purchase) could always be redundantly traced to any individual involved in any transaction. The only way a person can get ahead financially would be to increase the value of their productivity or services. Fortunately, it is human nature for most people to strive for the finer things in life, so the motivation to better oneself through a reasonable effort would likely tend to be the rule and not the exception. Most everyone can logically understand that raising one’s standard of living should involve reasonable effort and a willingness to contribute to the benefit of everyone else in any community, and certainly within a cooperative and united world society. 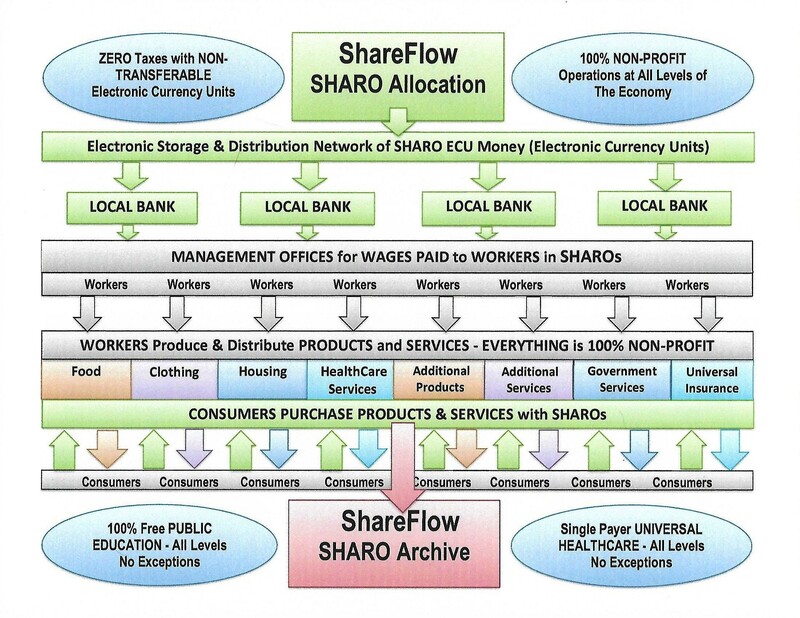 Researching the flux of business trends over time via archived SHARO Purchase Accounts within the ShareFlow Banking System would allow minor adjustments of the value of the Universal Standard Unit – The SHARO itself to reflect overall fairness to all and assure that an adequate flow of currency is always maintained. Management Offices within ShareFlow would research all means of gainful employment to assure that all wages are set and distributed in a fair manner irrespective of location, race, gender or position in society. In short, the goal would be for every man, woman and child on the planet to be paid adequately for their contributions in work related compensations for value given that contributes to the Common Good. All applicable factors regarding fair earnings for each job description would be submitted for computer analysis. Factors such as benefits to society, responsibilities, productivity, work energy, skills and job hazards would all be considered for setting wage levels. Based upon the analysis, each job description is assigned a fair standard wage or compensation. Elected officials, corporate heads, and other management positions would all be limited to appropriate predetermined salaries and compensations based upon the total picture of all considerations regarding their responsibilities and challenges in their work load. Within SANE, pay scales would no longer depend upon who you know, or what strings you can pull, or what ethnic background or gender you happen to be. Even menial task laborers could now earn as much as a bank president if the effort they put forth turns out to be of approximately equal value to Society! A direct overhaul of a sick world economy should begin with the adoption of the first of the eight subsystems of SANE known as the Universal ShareFlow Electronic Currency System (USECS), simply referred to as ShareFlow. It would be designed to maintain a continuous supply and a healthy flow of currency throughout a hypothetical 256 world nation state economy (explained in my website page entitled SANG Government. By disallowing any hoarding of funds by any individual, business, corporation or government, it would respond efficiently, fairly and proportionately to the needs of the entire extent of the world’s population. All currency and currency accounts (worldwide) would reside within the ShareFlow System and never need to transfer outside of the ShareFlow Network. SHARO electronic currency units would be approved for allocation from a local ShareFlow Network Bank Account to each local employee’s personal Savings Account within the Bank for ongoing monthly wage payments. Wages would be pre-approved for all eligible employees having their accounts with the Bank, thus employees would be paid locally according to their approved employee status as workers for any company in the local district. There would never be any deficit or overspending because ShareFlow would disallow any drift towards inflation, recession, depression or other economic imbalance. As a result, there would always be the correct amount of funding going to whoever needs and deserves it resulting from their employment status, and totally independent of profits from any individual, business, corporation or government. There would be no taxation of any type at any time since there would always be an endless supply of new currency created and allocated by the ShareFlow Banking Network residing in each local ShareFlow Bank. All social services would be provided for according to the priorities of human need. With ShareFlow, credit would never be extended or needed since the system would automatically prevent anyone from going into debt. Everyone would be compensated adequately for all goods and services rendered no matter what their station in life may be. The Universal ShareFlow SHARO Distribution would be the all-encompassing and comprehensive system that works efficiently by automating all global monetary transactions for earning and spending. Instead of credit cards or checkbooks, the USECS would automate transactions using Electronic Currency Units (ECU)s and archive them within ShareFlow in a special Currency Archive Account after they are used only once for a transaction. Every citizen would own one or more personal Account Monitors and a SHARO Account Debit Card replacing cash, credit cards and check books, etc. for transferring an appropriate number of SHAROs from their personal savings account in much the same manner as an ordinary debit card is used today. But in ShareFlow operations, the customer’s SHAROs are deducted from their personal savings account in their local ShareFlow Bank Account to a corresponding account in ShareFlow that deactivates that amount of SHAROs taken from the customer. Once spent, SHAROs are then taking out of the economic flow for placement into a corresponding ShareFlow Archive Account for later use in research and development of economic activity that would be monitored continuously by the ShareFlow System. All businesses doing any transaction as a purchase of a product or a service by a customer have only one responsibility in sales (no matter what the products or services may be). That responsibility is to make sure each transfer (within appropriate ShareFlow accounts) occurs timely and securely. Since the business does not have to keep track of profits which no longer exist or are necessary anyway, each business thrives automatically because every employee of the business is automatically paid in wages by ShareFlow in separate transactions. The entire SANE Economy would use backup capabilities and foolproof redundant code transactions to disallow any possibility of hacking of accounts. Every transaction would be recorded with the code numbers of both the buyer and seller and would be redundantly available within all local banks in the Universal Network that exist globally to redundantly track any error or attempted hack. The whole concept of the SANE Economy would be based upon the simple supposition that whoever deserves a specific amount of money receives it, and whoever does not deserve any specific allocation of currency will not get it unless they earn it or are set up to earn it legitimately. Within ShareFlow, The Universal Electronic Currency Units called SHARO are strictly Non-Transferable, thus disallowing any funds through investments, interest, leverage or other non-productive means. Since ShareFlow is owned, controlled and managed by the Shareholders (the people who hold Savings Accounts within the ShareFlow Banking System), the entire Operations of ShareFlow and the SANE Economy remain Totally Transparent to any citizen who wishes to monitor security and fairness of operations at any and all times. SANE will begin and maintain 100% Renewable Clean Energy technologies applicable to using the latest and most efficient means to fulfill energy needs for every locality. It can always respond by directing employment to focus on the best combinations of solar, wind, hydrogen storage and zero-point magnetics that can be used together in combination for each unique situation. In focusing on these four sources, it would also focus on comprehensive programs for conservation of all energy usage to meet normal requirements in each case. In many areas around the globe, a homeowner could fulfill all in-home energy requirements solely from the wind systems using a vertical axis wind turbines in modular arrays on rooftops with electrolysis of water for hydrogen storage or simply an efficient DC battery storage backup. In other areas, a combination of (SAS) Solar Array Systems) and (WTS) Wind Turbine Systems could be used to achieve the same goal, while in still other localities, a solar energy source alone might be enough to provide local user needs. With sufficient solar energy and/or sustained wind conditions, a homeowner might count on getting both total heating, total cooling and other electric power needs from an Integrated Energy Conversion System (IECS) using various combinations of any or all four of the clean energy sources mentioned above. In most cases, any IECS of appropriate design could prove invaluable in keeping energy demand & usage at peak efficiency for any location on Earth. For larger homes, estates, farms, ranches and corporate office buildings, the use of various combinations of solar cells and wind rotor generators might extend itself naturally to a larger variety of designs, sizes and combinations. Choices would depend upon prevailing climate, energy needs and the terrain involved, but logically speaking there would always be a best fit combination for an IECS. Standardized modular units of various capacities would allow any scenario to be customized for optimum performance. In situations where climate is highly unpredictable, where the winds tend to be calm most of the time, or where cloudy days predominate, larger units or alternate designs in combinations making up the choice for a best fit IECS might be needed. Due to the normal advance of technologies however, there will always be improvements to provide the same intent of adequate clean energy production without any reliance upon fossil fuels. Integrated solar and wind energy power plants could also be operated successfully on the open seas which could be alternately designed for fixed or mobile functionality. If mobile, they could seek out maximum solar or maximum wind energy areas, alternating their movement as necessary to take advantage of seasonal changes in available resources. Ocean based power plants might specialize in hydrogen production in storage for transport to land based users. WTS (Wind Turbine Systems) could be constructed with each module having a vertical axis turbine rotating like an anemometer. WTS could be designed for maximum efficiency in average wind conditions, could be operational at low and high wind speeds, and be limited to a maximum rotational velocity for protection in damaging winds. If used to supply power to a local community, the resulting electrical output could then be transformed to AC power at standard voltage for house current. using linear alternators instead of DC generators. The advantages of linear alternators include simple design, greater efficiency, compactness, and constant frequency AC power output. Likewise, each WTS could be power rated according to varying standard wind speeds. In other situations, a SAS (Solar Array Systems) could become standard power rated with respect to various sunlight conditions. Using electricity to produce stored hydrogen could also be used to produce a combination system for maximum efficiency that could be referred to as a SWHS (integrated solar, wind and hydrogen storage system. For rural areas, a SWHS (Integrated combination of solar, wind and hydrogen storage) would most likely be needed to provide a dependable and reliable source of electricity, and in many cases could provide supplementary hydrogen fuel or battery power for a family automobile. Homeowners could choose how many modules of each type would work best for their situation, considering climate, latitude, terrain, aesthetics and home energy usage. Properly designed and modularized units of SWHS systems acting together would likely be in phase with user energy requirements in higher latitudes most of the time. 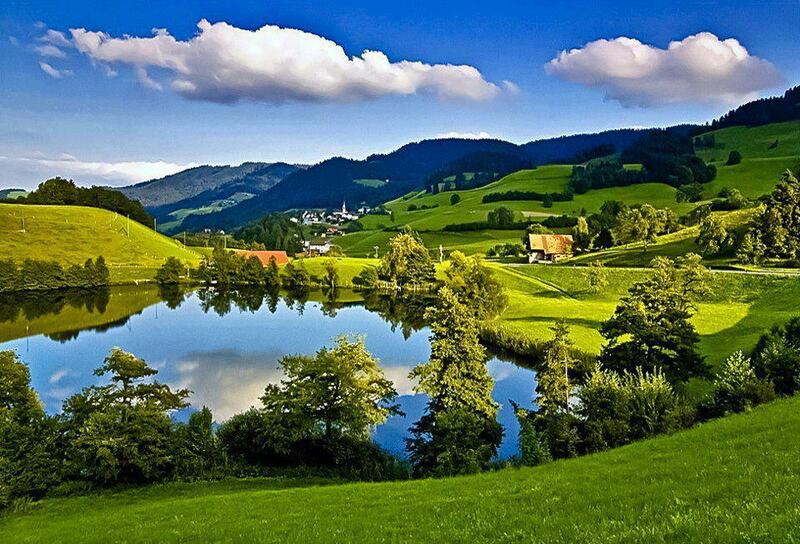 For example, on cold days, usually the weather will trend towards being either cloudy and windy, or it will be calm and sunny. In either case, some energy would most likely be produced most of the time. It would be on the cold windless nights of winter in moderate and high latitudes when storage systems would have to kick in as the backup to supply heat. Even with good insulation, a home would lose heat on a cold windy night. On these nights, heat loss would increase, but the energy conversion from wind energy systems would ALSO increase, thus off-setting the heat loss. And with adequate storage facilities, there would always be stored hydrogen to take up the slack if for some reason both solar and wind energy conversion units were ineffective for several days straight. On warm summer days, there would usually be an excess of solar energy conversion beyond the full capacity of the hydrogen storage system. In such cases, portable storage tanks of excess hydrogen could be made available for commercial distribution. Each SWHS could include a complete climate control system and facilities for maintaining a small greenhouse to supply produce for homeowners and their families. Climate control units would include central heating and central air conditioning, air filtering and ionizing, and humidity controls for home and greenhouse. Integrated solar and wind power systems being modular, could enable a homeowner, a farmer, a business or an industry to purchase and install only those units necessary to meet specific needs. All system units would be modularized and standardized for mutual compatibility, easy installation, and easy addition or subtraction from the total system. As technology advances, we have one more source of renewable clean energy to consider that is not talked about very much, but could become the ultimate clean energy source replacing all others at some point in our future. This is ZPE (Zero Point Energy) which will have many advantages over all other sources for 100% renewable clean energy as soon as technology makes the conversion process accessible to public awareness and be practical for many energy applications that can use it to replace solar, wind and hydrogen storage processes. In a nutshell, ZPE is the energy left over in any confined vacuum of space of any size or volume when all other sources of energy are removed. It is the theoretical state of a vacuum when the absolute zero (in temperature) is reached, and where no other form of energy can enter except the latent energy already existing throughout all points in the vacuum of space in this universe. In practical terms, zero-point energy consists of normally inaccessible but extremely ultra-high frequencies of electromagnetic waves that permeate all points in space, but are ordinarily undetectable with any of the usual scientific means in a laboratory. Using very unusual means and equipment, ZPE is detectable but so far not easily converted into useful lower frequencies of electromagnetic waves and ultimately the electricity we can use to do useful work in everyday applications. Basic practical use would consist of enclosed metal containers that have certain frequency transformation capabililty equipment embedded inside to convert the impinging high-frequency background radiation (coming in from all directions). This means that at any point in space it is theoretically possible to convert a bandwidth of ZPE electromagnetic waves into useful electricity so that can be used directly to run motors or be stored in high-efficiency lithium batteries. The huge advantage of ZPE is that these converters can be placed anywhere (inside or outside a building for example) which could theoretically extract energy from empty space independent of environmental conditions such as what solar and wind energies conversions rely upon. Another theoretical advantage is that once the technology is perfected, stand-alone units could be conveniently and modularly produced to run at most any size and capacity. Another huge advantage is that the energy could be extracted 24/7 without limit and be independent of directional placement, thus being the ultimate convenience and cost effectiveness with all free energy conversions for anything electricity is used for. The potential for practical use of ZPE is enormous, and the technology to make it accessible continues despite intense political pressures that try to keep it suppressed forever to favor the fossil fuel corporations who ignorantly want to continue business as usual with money, power and control of the fossil fuel energy industries forever. Fortunately, there is evidence that the day of reckoning for them is very close at hand. This sub-system of the SANE Economy will be set up to maintain 100% support for Free Public Education at all levels that would include tuition, books, support equipment and all new facility construction wherever needed. ShareFlow would supply funding for all employees (teachers, professors and all faculty support personnel) to assure 100% free education for all responsible students at all levels of public education. ShareFlow and the SANE Economy subsystems would assure that adequate supplies are provided in a timely manner to all facilities world-wide. ShareFlow and SANE could also keep track of the need for new job and employment opportunities in the field of education, and thus create new openings in order to direct appropriate employee personnel to fill these jobs whenever priorities dictate the necessity to expand schools and other educational facilities. SANE Economy subsystems would assure that adequate teaching methods at all levels of the global socio-economic network would be planned for, supported and adequately funded in the form of new job openings in all categories of necessary and priority personnel. SANE and ShareFlow working together could make sure that Public Education for all levels of the Public Need are covered and always adequately supported. Another important and very essential feature of SANE would be the Universal Standard Transaction Values subsystem. Its function would be to assure that all purchases of products and services are based upon fair value and exchange in SHAROs for value received for value earned. Once determined, these standards would remain fixed independent of location except for minor adjustments for slight variances in value over time. And with USTV, any customer would pay approximately the same costs independent of location anywhere around the world. Any product or service of value would always cost virtually the same no matter where it is purchased. This would be possible because all manufacturing costs and costs of distribution would be averaged out for any location on Earth while employees would work at a standard wage for each given job description. To make that work successfully, USTV would determine all expenses of production and distribution that are location dependent and set the costs according to the average. Production and distribution costs that are normally higher in certain locations would be compensated for by other means than passing the costs on to the consumer. A typical consumer purchasing any product anywhere in the world would no longer have to use coupons or look for special deals because the cost would be the same everywhere. Shopping for value at other locations based upon price consideration alone would be outmoded since every item whether it be groceries, pharmaceuticals, appliances, autos, fuel, airline tickets, etc. would cost approximately the same independent of location. In a similar manner, services rendered would cost the same independent of location. The only comparison shopping of either products or services would depend only on factors other than price, such as quality of products or services rendered. Comparison shopping would use the typical capitalistic principle of competition to ensure high quality control, but in a much more compassionate manner. It would focus on customer satisfaction involving quality of products, attitudes of sales personnel and track records of reliability, etc. All welfare programs would be replaced globally with Universal Minimum Standard Incomes (UMSI) adjusted for employee status according to their normal benefit to Society in their particular chosen field of endeavor. This would provide for every man, woman and child on Earth having appropriate standard wages intended for food, clothing, shelter and basic healthcare if they are gainfully employed. If they are unemployed (no employee status) and are not working or contributing to the benefit of the Common Good for whatever reason, they will not be paid wages as an employee, but will still be allowed to subsist on a minimal program of free subsistence basics including appropriate items of food, clothing, housing and basic healthcare. Equal allocations would be available to everyone, but would be accompanied with positive incentives to seek and accept employment in a field of their choice in order to contribute and justify their free acquisition of the basics. UMSI will be one of the most significant features of SANE. It would be a plan to replace traditional welfare with a minimum standard income that would be global in scope. Properly designed, it would automatically provide every man, woman and child on Earth with a reasonable minimum income appropriate to their status and station in life. With the entire SANE concept in operation, virtually everyone could find a favorable job opportunity of high contributory value. Because of that, Society should be more than happy to support a superbly efficient and (virtual) welfare state for everyone that will work equally well not only for the unemployed, but also the gainfully employed. Another way of looking at the UMSI is that it would be a virtual (but justifiable) Social Security Program for every man, woman and child on the face of the planet since it would be fair and equitable to all regardless of their status in life. It would be fair to all because every employed worker would get their base minimum income plus wages, while the unemployed for whatever reason would receive only their base minimum income, and must use it to subsist on. The relatively few who could work, but for various reasons would refuse to do so must use their base minimum income to purchase all the bare necessities, including food, clothing, shelter and basic health care. In every case, Non-Transferable SHAROs would be designed in such a way as to disallow use of a standard allowance for anything except designated essentials. Another one of the eight SANE subsystems is to replace all insurance companies with one Universal Comprehensive Insurance (UCI) to cover all types of needs. It would include life, accident, health, major medical, social security, unemployment, disability, property damage, loss of property, etc. As a vital part of SANE, this feature would be organized to facilitate all compensations with fair and equitable treatment for everyone on a priority basis. UCI would compensate fairly and reasonably for everything in a hierarchy of legitimate human need. Most important needs would be handled on a priority basis by directing appropriate employees to fulfill the need, but whatever other needs are applied for, they would be handled as soon as employees are available to do the required work to fulfill the need. This feature would abolish all the wasted effort, red tape and hassling typical of the thousands of competitive insurance plans of the 20th Century. This vastly more efficient program would no longer have to account for who is covered and who is not, or what is covered and what is not. All claims are handled on a priority basis, but in practice, all non-trivial needs would get handled eventually as long as our world society did not experience too many natural disasters all at once. If that did happen, then claims would have to be re-evaluated on a revised priority basis. UCI would set up to eliminate all other forms of insurance and disaster aid. UCI would provide for supplementary income and health care maintenance for seniors, and would take the place of all dependency on Social Security as we now have it, plus Medicare and Medicaid, which would no longer be necessary. UCI would automatically cover all natural disasters such as floods, tornadoes, earthquakes, fires, droughts, etc. There would never be a need for separate disaster aid efforts such as the hodge podge of insurance programs and charity drives we all know about. And because SANE would help spearhead a New Age of Cooperation and Care for Everyone, many of the traditional calamities brought on by humanity’s previous ignorance and folly would be notably reduced or eliminated. This fact would allow more funds to be available for compensation needed in natural disasters and help maintain the quality of life for all. To create maximum benefits to the entire global workforce, a subsystem of SANE known as the Universal Employment Matching (UEM) System. would be the logical need, and a perfect fit to rely upon in order to ensure ongoing success and support for all existing and potentially new employees at all levels throughout the system. Its functions would be to identify the best employment opportunities currently available globally according to applicant preferences, contributory value and real-time updates of new information coming in from job seekers and businesses seeking new workers. The goal of the UEM would be to keep everyone who is willing and able to work employed in the most optimum positions available for their skills, talents and personality. It could also create new opportunities, thus assuring that there would always be more beneficial well-paying jobs than job seekers. The UEM would be the most effective tool for keeping unemployment close to zero and employee morale close to 100%. The UEM would work for anyone whether they are already employed or not. For anyone currently employed and thinking about a change, it could act as a guide to an even better and more satisfying employment when it becomes available. And whenever a position of employment is phased out, UEM would be there to immediately direct the job seeker to a new and perhaps better situation. Working closely with UCJC, the SANE Economy would place top priority in keeping everyone employed as much as possible for best fit and most satisfying job situations in a world of constantly changing technologies and social transformation. Universal Capital & Job Creation (UCJC) would be the logical completion and entity working together with all SANE subsystems necessary for a SANE Economy. It would allocate necessary funds as wages to workers to create new jobs for businesses, schools and corporations with entrepreneurial and expansion plans for increasing selection and quality of products or improving training and services. It would also help direct logical movement of existing employees to other jobs of greater priority whenever such movement is dictated by the statistics of supply and demand in an economy working at top efficiency for the benefit of the Common Good. It could help maintain a vigorous and sustainable funding for Education at all levels from Kindergarten on up, and be the prime driver for ALL the priorities of public education. This would include full support for the traditional math, science and engineering programs needed for the building blocks of society. And perhaps even more importantly, it would give full support for all entrepreneurial social programs needed to insure, maintain and treat mental health, provide freedom from drug abuse, and teach young people the skills to interact in a healthy manner with their peers and fellow citizens when they become adults. Another high priority for necessary and ongoing capital would be directed to promising new renewable clean energy technologies to help bring them to the forefront of public awareness. The UCA would automatically provide the necessary funding for the most promising clean energy cutting-edge technologies that need full employee support and development to raise the public awareness for mass production where feasible. Any prospect for a sensible new invention, product or a service always requires capital to initiate, and would be adequately supported by allowing existing employment to re-direct to the higher priority operations. Since there are always new products and services that need funding, certain criteria would be used to determine the value of each endeavor before new job openings are created and assure that potentially wasted funding and efforts are minimized. As long as an invention, discovery or expansion of an existing business can be validated as a beneficial contribution to the Common Good, it could be given the necessary support. Each feature of SANE would contribute to an important part of the motivation for people at all levels to more fully cooperate for greater efficiency and quality of workmanship. All benefits to the Economy would undoubtedly affect social interaction as well. Even though SANE would be designed specifically for the economy, it is likely that economic benefits would spill over to strengthen social and cultural institutions in so many inexplicable ways. In other words, when people are in a good place with budgeting their personal finances, they will have more time to enrich the over-all quality of their social life. With the SANE Economy powered by ShareFlow interacting more freely with others, a set of mutually beneficial dynamics work over time to improve the lives of everyone involved in a very self-constructive manner. I would enjoy, and welcome, living in a world where the Sane Economy governed all global economic and social activities. Today’s global governance is. of course, very different. Do you have a plan for getting from here to there? In the US, we are told that we live in a democracy, and if we want change, we just have to vote for it. A Sane Economy, if a majority knew of it and voted for representatives who would represent us and implement it, could be implemented quickly in such a democracy. The problems of such an implementation are obvious to any aware and honest observer: such a democracy exists today nowhere in the world (with the possible exceptions of the Scandnavian countries). I do know of one project, now underway, to confront Congress and force their hand to pass legislation to fix the 12 ways our electoral system is rigged. If passed, it would enable true representation of We the People by our Congress (and President), and transform our faux democracy into a real one (or rather, a Constitutional Republic as the Founders intended). The plan, strategy and tactics is at UNRIG.net (with more links at #UNRIG). Such reforms are essential before a Sane Economy could come into being.